Chia seeds are packed full of protein. This recipe is the basic chia porridge – you can add more flavours, adding fruit, a spoonful of cacao or cocoa, a mashed banana or shredded coconut. Top with whatever takes your fancy. This needs to be prepared at least an hour in advance, but ideally the night before. 1. 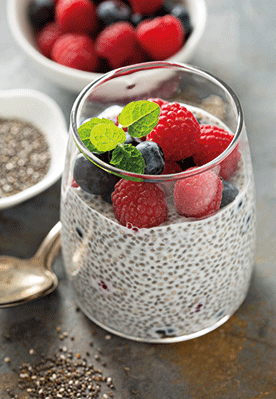 Place the milk and chia seeds in a bowl or jug. Stir in the vanilla extract. 2. Leave to rest in the fridge for an hour or overnight. You can eat this hot or cold. I prefer hot so I gently warm in a pan until it is heated through, adding more milk if needed. 3. Finish with a sprinkle of sweetener and some nuts and berries.